Tips from the Ruby Ruth Gang! Styling shelves is one those final touches that can really make your house feel like a home. It’s the right place to display your pretty accessories and sentimental knick-knacks, and just let your personality show! However, it takes a little bit of an artistic side to impress your guests with your shelving skills. If you need some tips, the Ruby Ruth gang comes to your rescue! As our characters are used to spending a lot of time decorating your shelves, they are happy to give a few tips. To create an attention-grabbing composition on a shelf, you can use objects in varying colours, shapes, textures and patterns. Try mixing old and new, hard and soft, round and square items. It’s the contrast between the different elements that creates interest. If Burt is sitting on your shelf and most of your objects are about the same size, he will place some of them on the top of a stack of books to help you create height. If you have trouble coordinating your pieces, it might be easier to keep a somewhat neutral colour scheme to some extend. But don’t forget to add something colourful somewhere on your shelf, as a pop of colour draws the eye. Valerie personally likes having varying shades of the same colour as another way to get the same type of result. Wooden picture frames, a small basket made of organic materials or a small plant adds a down-to-earth feel and even makes your home seem more inviting. As a bonsai tree lover, that is Renee’s favourite way to make your shelf come alive. Books are a great way to take up some space. However, you might want to mix it up a little if you don’t want it to look too much like a library. Arrange some of them vertically, supported by bookends (or your favorite Ruby Ruth Doll! ), and stack some of them in a small piles. You can also sort them out by the colour on their spine, to create clusters of colours on your shelf. Kevin is a big fan of the rainbow look you can get from colour coordinating your books! It is not always easy to find art pieces to go on your shelves, but if you have anything that would go well with your other objects, add it in! Mini Malcolm and Mini Rita love it when they get to sit in front of a drawing or a painting. They think it adds personality. Plus, technically, it draws your eye to the back of the shelf, adding depth, while also helping to cover some of the wall, breaking up the white space with a pop of colour! 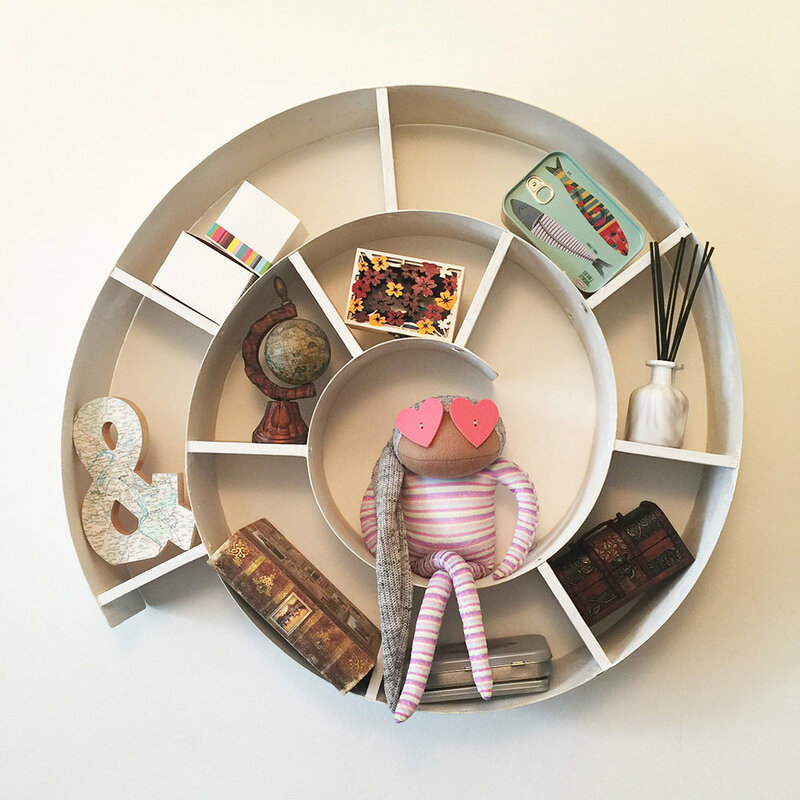 Some of our doll’s favourite shelves to sit on are ones that manage to tell a story. Consider placing a couple of beloved photos in gorgeous frames and displaying them alongside objects that help tell that story. For example, a photo of your favourite holiday with a small object from your trip and a stub from an attraction you went to, or a large glass jar that you can fill with movie stubs or wine corks.